Olympic silver medallist Samantha Murray cut the ribbon to mark the new Aldi officially open with the help of pupils from West End Primary School and Store Manager, Tim Robinson. Olympic silver medallist Samantha Murray officially opened Aldi’s new Morecambe store in front of a crowd of local shoppers. The Team GB star, who won silver in the Women’s Pentathlon at London 2012, cut the ribbon to mark the store officially open with the help of pupils from West End Primary School and Store Manager, Tim Robinson. Aldi also rewarded the first 30 customers who arrived this morning with a complimentary bag full of fresh fruit and vegetables from Aldi’s Super 6 range. After the opening celebrations, pentathlon star Samantha visited West End Primary to deliver an inspirational assembly to pupils on the benefits of healthy eating and exercise. The assembly came as part of Aldi’s ‘Get Set to eat Fresh’ initiative, which aims to educate 1.2 million young people aged 5-14 across the UK to develop a love of eating and cooking with fresh, healthy foods. Speaking after the opening celebrations, Samantha said: “What a fantastic welcome this morning! The guys on the Aldi Morecambe team did a fantastic job of preparing the store this morning and it was great to chat with them all and see how excited they were. 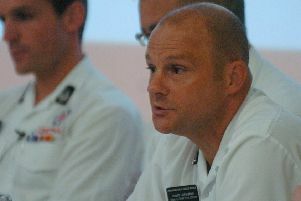 Store Manager, Tim Robinson, added: “Today was a brilliant start for the store. The team and I were thrilled to meet Samantha – seeing an Olympic medal up close was something we’ll remember for a long time!